Lovelane relies on the generosity of our friends and community. It is this invaluable support that keeps our program thriving. There are many ways that one can choose to support us financially, please click on the link below or contact Lovelane for additional information. Thank you for helping us support our Lovelane families and horses! You may choose to honor the memory, life, birthday or wedding of a loved one with a gift to Lovelane. The individual or family honored will receive a letter letting them know you made a donation in their name. The amount of the donation will not be disclosed. Many donors opt to make a gift of stocks, bonds, and shares of mutual funds. If you are interested in making a gift of stock, bonds are mutual funds please find transfer instruction here (link to transfer instructions) or contact: Stephen Doyle at 781-0259-1177 ex. 27 or Stephen@lovelane.org. 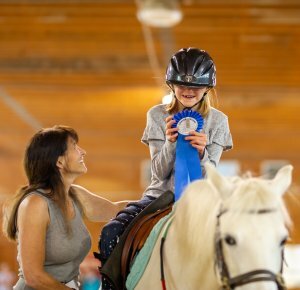 Spring horse show at Lovelane Farm on May 6, 2018. Making a planned gift to Lovelane ensures your support will continue into the future. For more information on how to make a planned gift please contact Eliza Wall at 781-259-1177 x24 or Eliza@Lovelane.org. We recommend that you also speak with your financial advisor to determine if a planned gift would be beneficial to both you and Lovelane. For more information about making a donation to Lovelane please contact Eliza Wall at 781-259-1177 x24.